From the moment the intro loads up in The Invisible Man you know this is not going to be your standard pokies experience. The Invisible Man is based on the 1933 science-fiction film of the same name and the pokies version is a Sin City-esque masterpiece of film noir eeriness. Leading gaming software gurus Net Entertainment have collaborated once again with Universal Studios to bring this creepy yet fascinating tale to the world of online gambling and the result is phenomenal. Using the latest in HTML5 technology, The Invisible Man is another triumph for NetEnt. The story of The Invisible Man comes from the H.G. Wells 1987 novel in which a chemist invents a drug that creates invisibility. After relishing the power that invisibility gives him, the drug ultimately brings horrendous side effects and the chemist starts to go insane. He wreaks havoc on the town as he tries desperately to restore his visibility, terrorising the town’s residents in his urgent attempt to be seen again. It’s delightfully disturbing and although an unexpected choice, this collaboration between NetEnt and Universal Studios is utterly superb. The Invisible Man gained instant status amongst online pokies players due to its unique, ultra-cool backstory and striking graphic quality. It can be found at a range of leading online casinos and is available in free play mode or for real money bets in Australian dollars. Our recommended secure online casinos to play The Invisible Man for AUD wagers are listed in the table of top-rated casino sites above. These reputable casinos offer a range of secure deposit and withdrawal options for Aussie players, with payment methods including direct bank transfers, Visa, MasterCard, debit cards, NEteller, Paysafecard, ecoPayz and Skrill. Along with incredible 3D graphics and crystal clear animation, The Invisible Man uses a five reel, three row pokies format with 20 fixed pay lines. It can be played in practice mode for free or for real money gambling with minimum bets starting at 20c and maximum bets capped at $100 per spin. Wins are paid from both left to right and right to left, which means players have 40 ways to win on each spin. The Invisible Man starts with an exciting opening animation sequence to set the scene for this eerie game. The reels are just as impressive, with animated symbols consisting of the original characters including Dr Griffin, Dr Kemp, Flora Cranley, Mr and Mrs Hall and the detective. There is no scatter symbol but two wild symbols. Wild Symbols – wilds are the police symbol and the Griffin symbol. The police wild appears only on the first reel and the Griffin wild only appears on the last reel. 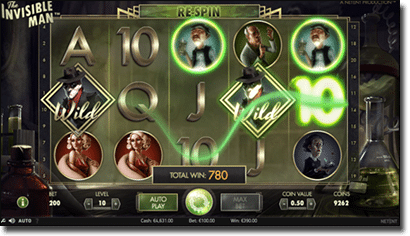 An appearance of either of these wilds will trigger free spins and during free spin rounds the wild shifts one position and re-triggers another free spin, continuing until there are no more wild symbols on the screen. There are two meters at the top of the screen, the Police Meter and the Griffin Meter, which are filled up each time one of these wilds moves off the screen. Free Spins – the free spins are triggered by the wild symbols explained above and can activate up to 30 free spins if you have multiple wilds appearing on the same re-spin. If both wild symbols appear at once during free spin rounds anywhere on the reels you’ll also receive four additional free spins. Activating free spins by landing the wild symbols is also the only way to trigger the Police Free Spins round or the Griffin Rage Bonus. Police Free Spins – this is activated by filling up the Police Meter at the top of the reels any time a police wild symbol moves off screen. Upon filling up the meter, you are awarded with an extra three free spins which include the appearance of a random fire wild symbol. The addition of the fire symbol increases the maximum win per spin of 90,000 credits when placing the maximum bet, or a huge 270,000 credits if all three free spin games are activated. Griffin Rage Bonus Round – trigger this awesome pick and win style bonus round by filling up the Griffin Meter at the top of the reels. You’ll be taken to one of three locations, either the Lions Head Inn, Ipping Station or the Mansion where you’re given the chance to pick an item which will either award you with an instant prize, a multiplier or a police hat symbol which will end the bonus round. It’s not every day that a pokies game has a “wow factor” as high as The Invisible Man. This game is beyond striking, with a haunting atmosphere and element of suspense that is a pure pleasure to play. The use of melancholy colour tones is unexpectedly wonderful, with creepy music and sound effects to really boost the sinister vibe. The fact that the bonus rounds and gameplay features are also fantastic is just an added bonus on what is already an awe inspiring online pokies experience. NetEnt certainly let us know that the future of video slots is incredibly bright if this is the kind of innovative work they are capable of. Aussie players can enjoy The Invisible Man and other NetEnt/Universal Studios collaborations like Scarface and Frankenstein for real money bets at reputable online casinos like G’Day Casino. Take advantage of the unlimited matched deposit welcome bonus at G’Day Casino to try your luck at the huge range of pokies and other casino games available like blackjack, roulette and poker.